Health geographer, Associate Research Fellow at the College of Humanities of University of Exeter. Her research interests are situated at the interface of spatial and environmental humanities and the social sciences, specifically the intersection of geography, social sciences, and medicine. The photovoice project reported in this article forms part of ‘Remembering the Mental Hospital’, a Heritage Lottery funded project, which besides creating a digital archive of Exminster Hospital, a former psychiatric institution near Exeter, UK, applies a more-than-representational approach to explore how individuals experienced the Hospital. It follows numerous calls to delve into the experiences of staff and patients to retrieve asylum geographies from below (e.g. Park 1995; Gilbert/Park/Simpson-Housley/Scott 1996; Parr/Philo 1995; Parr 1991). Previously, the combined efforts of academic disciplines, including geography, architectural studies, and social history in exploring various aspects of the hospital’s architectural, spatial, and geographical history (e.g. Alderman 1997; Topp/Moran/Andrews 2007; Parr 2011; Philo 1987; 1995; 2004), have resulted in a refined understanding of hospital space as a ‘complex social, cultural, and medical phenomen[on]’ (Topp/Moran/Andrews 2007: 2). The initial focus of many such spatial asylum studies has been to trace the emergence of moral architecture and therapy, and the therapeutic landscapes these edifices produced (Tomes 1994; Curtis 2010; Gesler 1992). In geography in particular a basic distinction between geographies of mental ill-health and geographies of mental health facilities has emerged (Philo 1997). Hospital space was vital to both. The latter comprised facility utilisation and community opposition to mental health facilities sparked mainly by deinstitutionalisation (Smith 2007; Dear/Wolch 1987; Dear/Wittman 1980; Dear/Taylor 1982). The shift from institutionalised care to care in the community over the past decades has, from a geographical perspective, been reflected in a turn towards ‘post-asylum geographies’ (Park/Radford 1997; Wolch/Philo 2000), focusing on individuals’ interaction with spaces and places in a range of settings in the community and institutions (Curtis 2010; Kearns/Joseph 2000; Philo 2000). We owe it to these developments, that we now have a well-established picture of the former ‘lunatic asylum’ in its physical geography (locations, design, immediate and wider surroundings) and its polarised functions as spaces of sanctuary and custody (Philo 2004). However, such studies also leave important questions unanswered. Many, for example, allow for an exploration of ward experiences and shed light on how the external hospital grounds were perceived, but only scant information is available on the perception and appropriation of social spaces within and surrounding the asylum – despite the cognition that within institutions, cultural practices created understandings of certain spatial conventions, ‘… such as the contrast between public and private space, family and social space, cultural and utilitarian space, the space of leisure and the space of work’ (Foucault 1986). We are also only just beginning to gain some insights into how staff in particular experienced and (re-)produced the hospital space in ways that differed from patients, visitors, and the local community. Within this context, the photovoice element of ‘Remembering the Mental Hospital’ serves to explore former staff’s perceptions of Exminster Hospital. Photovoice (Wang/Burris 1994; 1997) has been chosen as a method of triangulation with interview transcripts, visual sources, and discussion groups, following encouraging results with photo elicitation (Harper 2002), i.e. interviews with photos that have resulted in increased reminiscence. It therefore follows into the footsteps of an increasing stream of research applying visual methods as part of participatory research in health and social sciences (Catalani/Minkler 2010; Fraser/Al Sayah 2011), but differs from such approaches in its aims, as it focuses on a heritage site and does not aim to advocate change. The key analytical framework for the photovoice component of ‘Remembering the Mental Hospital’ draws from the socio-spatial concept of French Philosopher and Sociologist Henri Lefebvre (Lefebvre 1991) to explore the complex configurations and representations through which asylum space is produced, performed, and experienced. According to Lefebvre, space is shaped by the conceptions of outsiders (planners), attitudes and perceptions of its inhabitants, and the practices and experiences of individuals within this space. Space is therefore not a mere ‘container’ in which social life takes place, but ‘a product of social translation, transformation and experience’ (Soja 1989: 80). Lefebvre developed a triad (Lefebvre 1991) of spatial dimensions in which ‘conceived space’ constitutes ideal space created by planners and architects with distinct preconceptions as to how it should be used. ‘Perceived space’ refers to space as a social product and as such is integral to the analysis of power relations and hierarchies. Evidence from Exminster Hospital illustrates that ‘perceived space’ created opportunities for patients and staff to shape space in ways not intended by the planners. Hence, the space created by planners is ambiguous in many ways and consequently subject to constant negotiation. Finally, Lefebvre allows for the production of alternative space – termed ‘lived space’ – where the rules created by the built environment and power relations do not apply. Alternative space can be real or imagined space that often challenges commonly held beliefs about hospital realities. It may expose hospital planners and architects to informal spaces within the hospital premises that remain unnamed or unmapped and may ultimately trigger alternative restructurings of the prevailing social spatialisation (Shields 2001). Lefebvre’s concept has been taken up by a number of theoretical geographers (Soja 1996) and developed into one of the most influential theorisations of space in the Anglophone context, but has been underused in critical engagement with hospital space. Evidence from Exminster Hospital reveals that using architecturally planned space in an alternative way can allow individuals to engage in positive and meaningful social interactions without the constraints of separation, daily routine, and established social hierarchies, thereby providing social support by functioning as spaces where patients can connect with each other and staff. The focal point of interest for this paper is the last element of the spatial triad, which relates to space produced and imbued with personal interpretations. According to Lefebvre, the body plays a central role in this interpretative process, as space is produced through ‘the body of space’ (Lefebvre 1991: 201). Space inhabited by a body is therefore transformed into appropriated space, which superimposes conceived space and can result in space being used in ways not intended by the planners. Appropriating space in this way allows individuals to own rather than merely inhabit certain spaces. Hospital studies have shown how patients take ownership of their rooms and even their beds (Ankele 2009), but there is as yet a dearth with regards to such actions relating to hospital staff and social spaces within the hospital, issues this photovoice project is seeking to address. Ethics approval for the project was granted by the University of Exeter in May 2015. Starting in July 2015, participants were recruited through parish newsletters, project leaflets, the project website as well as word of mouth. In total, we recruited 32 people, including former hospital staff, patients, and members of the local community, some of whom are now resident in the former hospital building. All participants signed informed consent sheets, specifying details regarding the use of the pictures and picture ownership. Upon request of several of the participants, codes rather than names have been used in this paper to grant anonymity. After several training sessions, the picture taking process lasted from January 2016 to May 2017. Although standardised digital cameras were on offer for participants, most preferred to use their own equipment with which they were already familiar. Participants were given the freedom to take as many pictures as they wanted during the time period stated above and they could decide when to take pictures and whether they wanted to take them on their own, in pairs or small groups. Participants were asked to email their pictures to the project manager at the end of each month in order to be prepared for discussion in workshops and interviews. Exminster Hospital closed in 1987. Since then, large parts of the former complex have been razed to the ground whilst the remaining buildings have been converted into luxury apartments. Permission was therefore obtained from the property management group for participants to enter the premises and take pictures. However, the destruction of parts of the former hospital resulted in reduced photo opportunities. Therefore, participants were encouraged to delve deeply into their own picture albums and to search local archives and newspapers for photographs. As a result, they were not necessarily able to remember why a particular picture was taken and therefore were asked to explain during the discussion sessions and interviews why they had chosen particular images. 287 photographs were taken during the 17 month phase. Most of these cover the current state of the former hospital premises and the outside of the buildings still in existence. Pictures relating to the inside of the hospital stem mostly from private picture albums and local archives. Oral histories and visual sources were analysed at the same time, with cross-referencing of themes. Content analysis of the photographs explored similarities and differences of items photographed by the participants, aiming to complement thematic analysis. Most interviews were conducted on a one-to-one basis, but nine participants were interviewed in pairs and/or small groups. All interviews were transcribed verbatim and analysed using NVivo 11. The photovoice element reported here was affected by three limitations. Firstly, the majority of project participants were females of retirement age. This is consistent with the greater representation of women in the age group 65 and over, which make up the majority of former staff and patients of the Hospital. Secondly, allowing participants to use their own photographic equipment resulted in varying quality of the images which was compounded by varying degrees of experience in taking pictures, particularly of images in photo albums and archives. Finally, the photographs had to be taken and discussed in a specific time frame, which prevented some potential participants with valuable experiences from joining the project. Two hospital spaces have been selected for presentation in this paper. Both have been photographed by a number of project participants, having clearly left a legacy in their memories, but have not been talked about much in the existing literature. 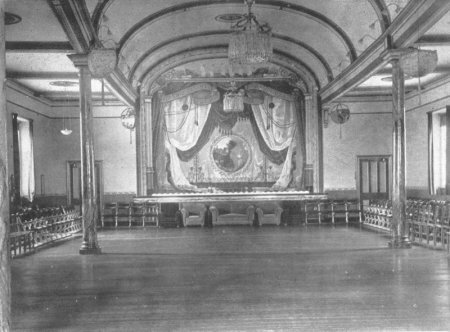 They are the Recreation Hall (also often referred to as the ‘Ballroom’) and the sports grounds. One reason why these spaces are so deeply rooted in people’s memories could be that they allowed a blurring of the rule of segregation around which all psychiatric institutions of the time were designed. 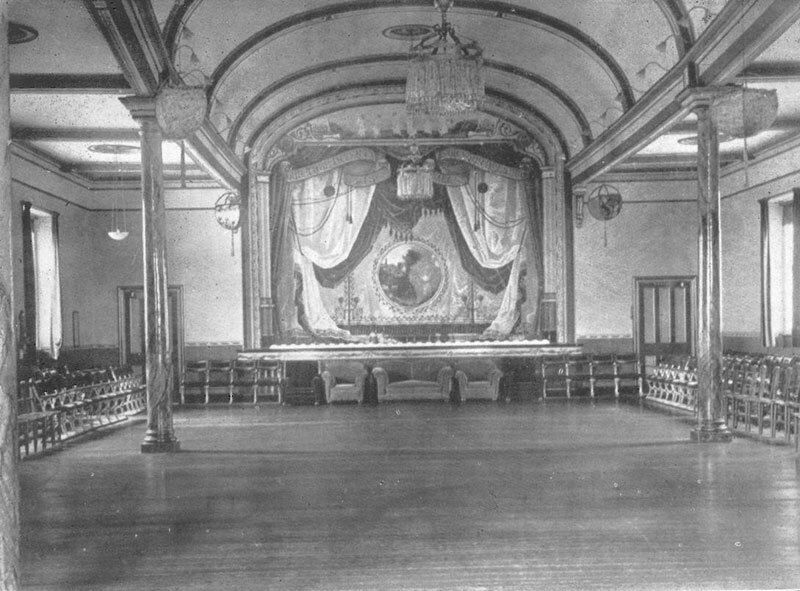 Added to the Hospital in 1887, the Recreation Hall was initially intended to provide entertainment for staff in the form of annual balls and educational opportunities for patients. ‘The Annual Ball was something. Tops and tails. No drinks allowed. Mind you, times were better then. Much better before they “grouped” us. Everyone worked together as a team’ (Participant EHF09). ‘One of the main features of the year was the Annual Ball. Everyone would dress up. A lot of the men who had them would wear dress suits. The ladies always in ballroom dress, and it was a fine affair. The food was out of this world’ (Participant EHF12). 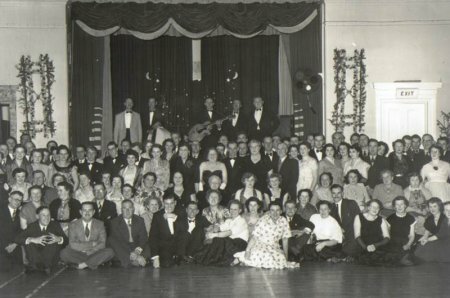 Several participants coming from families who had worked at Exminster Hospital for generations recalled that the Ballroom was initially a space for entertainment for staff only. For patients, it had educational purposes instead. Patient education would take place through ‘lantern lectures’. The magic lantern, an early type of image projector employing pictures on sheets of glass, arrived in the DCLA from the USA and became firmly established as a tool of moral treatment (Layne 1981; Godbey 2000). At that time, mental illness was reclassified as a clinical disease with its origin in the brain structure and lantern lectures were thought to be beneficial to patients in various ways. Firstly, it was believed that the images presented to the eye by the lantern would transmit to the brain, thereby rectifying brain malfunctioning (Godbey 2000: 33). Additionally, such lectures prevented boredom amongst patients whilst not being too taxing for the brain (it was believed that too much mental activity could result in insanity as well) (Godbey 2000: 50). Lantern lectures also brought patients together in groups, an essential step for their return to the community (Eager 1945). Yet, staff also inhabited the same space, and hierarchies were clearly observed. While patients were watching the shows, staff were watching the patients, evaluating their behaviour. Patients were also encouraged to observe and mimic staff’s comportment. Although patients and staff therefore physically shared the same space, they did not (yet) share it in terms of power. In the 20th century, the educational function of the Recreation Hall took a back seat. Patient entertainment was now considered a priority, as ‘patients did not go out very much and you had to provide for their social life as well as their medical and domestic life’ (Participant EHSM03). Entertainments included a weekly dance. 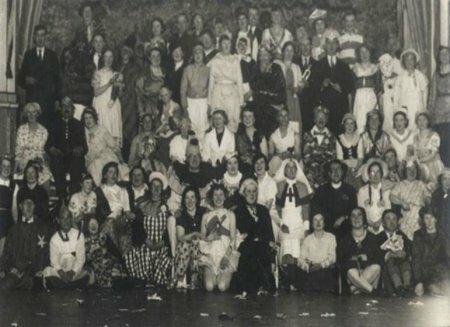 One member of staff recalls that during the dances the ‘males used to sit one side of the hall, the females the other. When the music started, they got up and met in the middle. They danced around and then they went back to their own sides again, so that was the only contact the females and males had’ (Participant EHSM10). 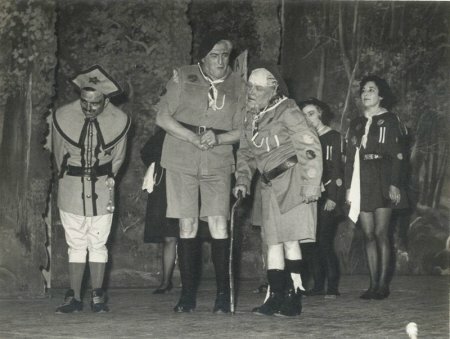 Apart from dances, theatre companies, such as the Pantomime company from Theatre Royal in Exeter or the Topsham Amateur Dramatic Society, frequently visited the DCLA, and reports show that ‘the patients thoroughly enjoyed the [plays]’ (Medical Superintendent’s Monthly Reports, February 1931: 12). 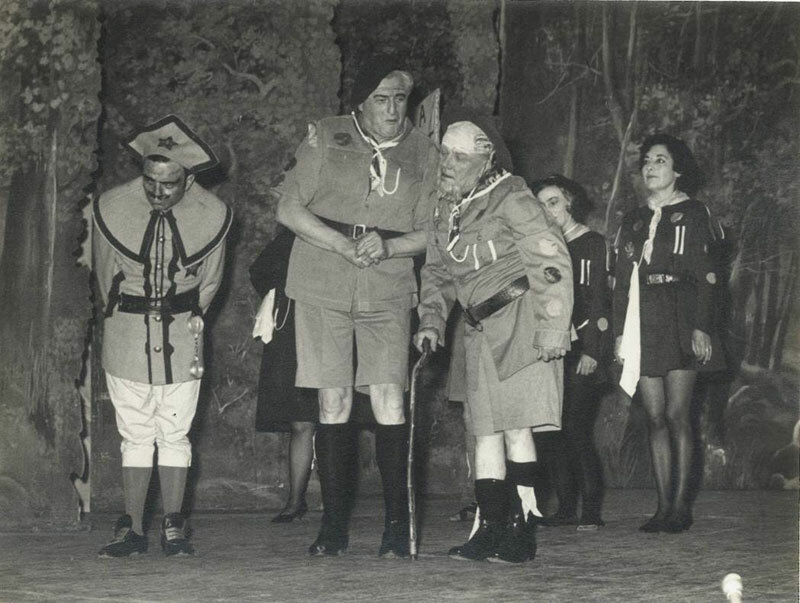 Looking at pictures of pantomimes, staff recall their popularity with staff, patients and increasingly the local community who would come to the Hospital for the event. It has to be mentioned, however, that segregation was still prevalent until far into the post-war years and separate shows were put on for patients and villagers. 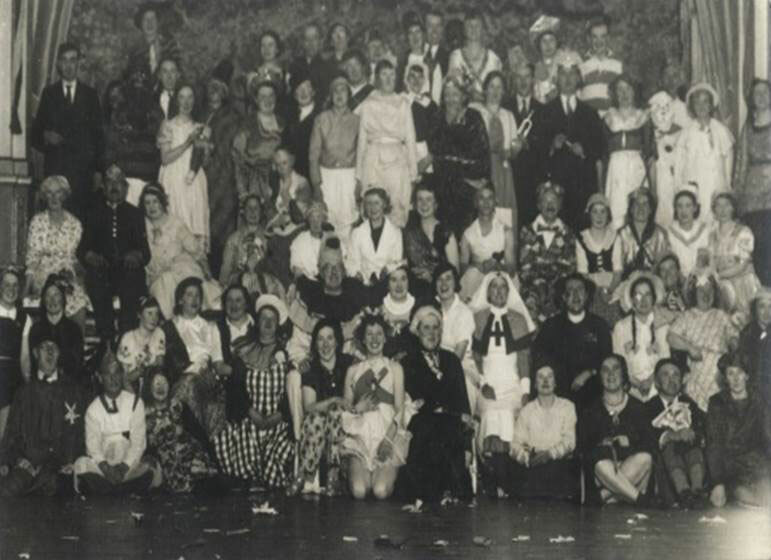 ‘The other night of the era was the patient’s fancy dress ball. People would dress the patients up in all sorts of things and staff were also sort of dressed up and we had all sorts – it was very good, yeah. But then, it’s what you can do in an institution. But television killed it’ (Participant EHSF30). Patients also benefited from the visit of the occasional magician or comedian and later on ‘moving pictures (films) were shown once a year by a man with a portable machine’ (Participant EHSF07, remembering the year 1915). ‘All hospitals had a good orchestra. Lots of what they then called Attendants were ex-Army men and many of those were Kneller Hall trained musicians, and in fact, it was not unknown to see an advertisement in the local paper: “such and such an Asylum require Attendants, preference given to clarinet or cornet players”’ (Participant EHSM03). ‘he seems to be getting very dull the last two years he has been in the Institution, I don’t think he is allowed to take part in any amusement or even go to the pictures, now this is what he wants, to brighten the poor boy up a bit otherwise he has to just mope around day after day and his life is one monotony’(Participant EHPM15). This brief outline illustrates that over the decades, the Recreation Hall was transformed from a space planned as entertainment space exclusively to staff and a learning space for patients to an environment conducive to the healing process where both staff and patients interacted in a meaningful way to one where staff even acted for patients, leaving both groups with fond memories of this space. 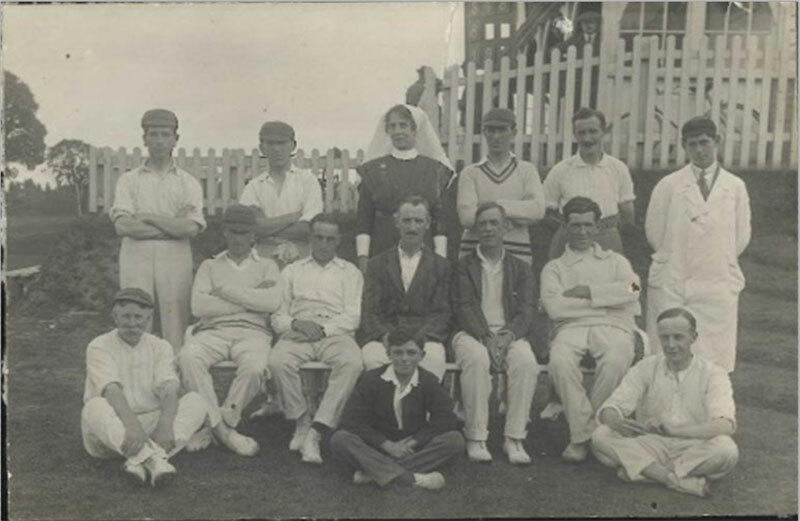 In line with most other Victorian psychiatric institutions, Exminster Hospital placed much value on physical exercise and soon after its opening, a cricket pitch was put in place for the exclusive use of hospital staff. ‘In those days you had to be good to get in […]! Either in sports or as a musician. How I got in was Mr […]. He was the clerk and steward and he came up the garden one day and said “do you play cricket?” I said “yes” and he said “you will play for us on Saturday. We are short and we are down in Bodmin”. I said “yes, but I haven’t got any cricket gear”. “Don’t worry about that”, he said, “you come in the office”. He wrote down – flannels, boots, sweater, shirt, – the lot, and said “you go in town and get it, and the hospital pays for it. That was my first match, in Bodmin, and then I played ever after. They had quite a good team” (Participant EHSM29). ‘they used to use [Hallett Clinic] as a training ward as well for doctors. You’d get all sorts, all different nationalities. And a lot of them were coming in the summer because of the Cricket team – you could watch the cricket from out of the window from the ward and then the doctors used to come in watching the cricket. It’s, like, you’d often find them missing and they’d be up there watching it’ (Participant EHSF02). Starting in the 20th century, however, patients got involved in the sports activities. Initially, their role was restricted to that of spectator. Watching staff play cricket was considered a form of patient entertainment – all the while the strict segregation between male and female patients was adhered to (Medical Superintendent’s Monthly Reports, September 1931). One staff recalls that ‘[Cricket] was very good entertainment for us and also for the patients. The patients were brought out. The females would sit on one side, the males on the other, on stools. Some would fall asleep in the sun’ (Participant EHSM24). His memories illustrate that a space originally intended as an exercise ground for staff had been transformed into a space of relaxation for patients. ‘The patients’ sports were all marked out on the pitch. Mr […] would be on the line with the bell lining them up with other nurses. The males used to run separate from the females. They had obstacle races. After each race they would come up to the pavilion for their prize. […] Mrs […] would give out the prizes as I announced them. Now, we had one patient, a dear soul, she would come up with her apron on, and she would say “Here is your prize” and it might be a little purse or something. She would say “I don’t want that, I want snuff”. Mrs […] would say “we haven’t got snuff, have we?” I said “no”. This patient used to stand there with brown snuff all down over the front of her dress and under her nose, and we had an awful job to palm her off with the prizes without her snuff’ (Participant EHSM10). The cricket pitch in particular was also a space where patients could engage in some meaningful activity and one could almost claim that power roles reverted: ‘we had two patients that did the scoring. Their books were excellent, really immaculate’ (Participant EHSM10). 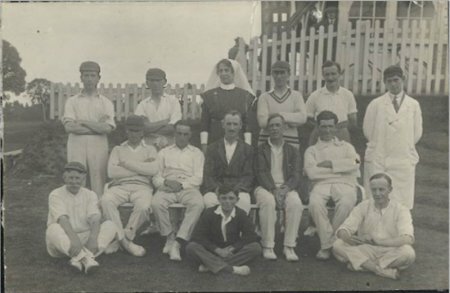 Team sports were initially restricted to cricket, but in the 20th century extended to include football and tennis. 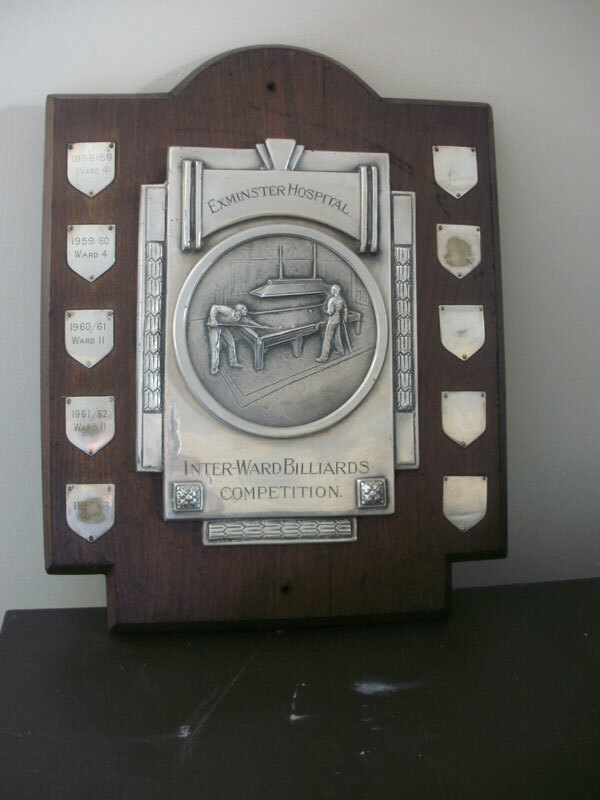 One former male nurse remembers that if you were a younger person applying for a job at the Hospital in the post-war years, you were expected to play sports, as ‘that was entertainment for the patients’ (Participant EHSM02). Being a football referee, he recalls that ‘they used to take patients’ football teams off to the Hospital at Dorchester and the one at Taunton, Tone Vale, I used to go with them and get paid for it as well, that’s the best part of it’ (Participant EHSM02). After WWII, patients were also allowed to join sports clubs in the City of Exeter, which provided another increase of opportunities. In the late 1950s, the Hospital received a Billiard table and the various wards put teams together who would regularly play each other to win the coveted trophies in annual inter-ward competitions. ‘I have been unable to persuade any of the members of the family to visit Mr […] here [in Exminster] – they say they would visit him in Redhills or the City Hospital, but not in Exminster, and none of them was intelligent enough to voice their fears about the place’ (Participant EHSF13). ‘The other main event through the year was the sports on the sports field. Now, marquees were set up in the fields and we had a big tent of our own. […] The upholsterer, he made small side-show tents. We had Madame X. We had all different side-shows. The building staff used to make funfairs, roundabouts and swing-boats for the children’ (Participant EHSM10). 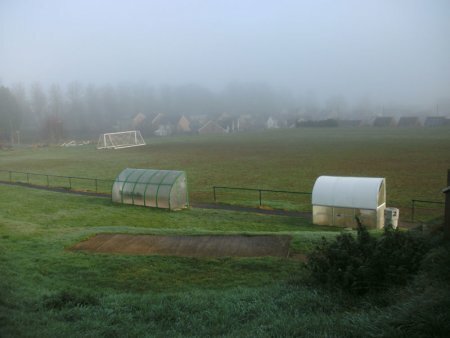 Contrary to the pantomimes, sports events were not held separately for patients and villagers and despite the reservations of some members of the local community, people’s stories and local newspapers provide evidence that the Exminster Hospital sports grounds were increasingly used by the local community. Children took advantage of the tennis courts and one villager recalls attending Hospital Sports Days for the food. He remembers one patient, the cricket scorer ‘would put the scores on the board and then he would go off and get the food that would come off the truck and then he would put it into the pavilion for the players. Some of the best sandwiches in town we used to get in there’ (Participant EHSM02). This way, spaces provided for entertainment and exercise did not only bring together patients and staff at the Hospital, but also fostered links with the local community and some long-lasting friendships were struck up between patients and residents of the village of Exminster. This article applied Lefebvre’s concept of socially produced space to Exminster Hospital. Based on images, oral histories, and memories of staff, patients, and local residents, it examined how two spaces planned by architects were experienced, performed, and ultimately transformed into new space whose function, at times, contradicted original intentions, but provided environments where patients could engage in meaningful social activities that transcended existing rules and hierarchies. It examined the Hospital at a time when the days of this crumbling Victorian edifice were already numbered. With the therapeutic optimism of the previous century long gone and rickety with chronic staff shortages, practices of warehousing incurable patients were to be replaced by care in the community, making such hospitals seemingly redundant. Existing scholarship on the history of psychiatric facilities has largely focused on their oppressiveness, surveillance, and failure to cure patients. Concentrating instead on people’s stories and memories through photovoice has stimulated collective dialogue and engaged diverse audiences in discussions about Exminster Hospital, thereby illustrating that the Hospital was by no means uncaring or inhumane by default. There was great community spirit, it was a place where patients and staff felt supported and safe. This does not mean that everything was well. Financial constraints and staff shortages hit the Hospital hard and incidents did occur, however, it was a place where people were proud to work to the best of their abilities to accommodate patients and their needs. Whilst the Hospital was a world in its own, our research also shows that it cannot be separated from the surrounding village or, as one former staff put it, ‘the Hospital was a community and the village was the Hospital’ (Participant EHSF19). ‘Remembering the Mental Hospital’ therefore fills an important gap in the historiography of psychiatric institutions, focusing on the transformation of space through a unique combination of archival materials, images, and voices of staff, patients, and the local community. Alderman D. H. (1997): Integrating space into a reactive theory of the asylum: evidence from post-Civil War Georgia. Health & Place. 3, 111-22. Ankele, M. (2009): Alltag und Aneignung in Psychiatrien um 1900: Selbstzeugnisse von Frauen aus der Sammlung Prinzhorn. Wien. Catalani, C./Minkler, M. (2010): Photovoice: A Review of the Literature in Health and Public Health. Health Education & Behavior. 37, 424-451. Curtis, S. (2010): Space, place and mental health. London. Dear, M. J. (1987): Landscapes of despair: from deinstitutionalization to homelessness. Princeton. Dear, M. J./Wittman, L. W. (1980): ‘Conflict over the location of mental health facilities’. In: Herbert, D. J./Johnston, R.J. (Eds. ): Geography and the Urban Environment, Volume 3. Progress in Research and Applications. Chichester, 345–362. Dear, M. J./Taylor, S. M. (1982): Not on our street: community attitudes to mental health care. London. Eager, R. (1945): The treatment of mental disorders: ancient and modern. Exeter. Foucault, M. (1986): Of Other Spaces. Diacritics. 16, 22-27. Fraser, K. D./Al Sayah, F. (2011): Arts-based methods in health research: A systematic review of the literature. Arts & Health. 3, 110-145. Gesler, W. M. (1992): Therapeutic landscapes: Medical issues in light of the new cultural geography. Social Science & Medicine. 34, 735-746. Gilbert, E./Park, D. C./Simpson-Housley, P./Scott, J. S. (1996): Battles from below: A literature of oppression. Geojournal. 38, 19-28. Godbey, E. (2000): Picture me sane: photography and the magic lantern in a nineteenth-century asylum. American Studies (Lawrence, Kan.): 41, 31-69. Harper, D. (2002): Talking about pictures: A case for photo elicitation. Visual Studies. 17, 13-26. Kearns, R.A./Joseph, A.E. (2000): Contracting opportunities: interpreting post-asylum geographies of mental health care in Auckland, New Zealand. Health & Place. 6, 159-69. Lefebvre, H. (1991): The production of space. Cornwall. Layne G. S. (1981): The Kirkbride-Langenheim collaboration: early use of photography in psychiatric treatment in Philadelphia. The Pennsylvania Magazine of History and Biography. 105, 182-202. Massey, D. B. (2005): For space. London. Medical Superintendent's Monthly Reports, Exminster Archives, 1931 (uncatalogued). Moran, J. E./Topp, L. E./Andrews, J. (2011): Madness, architecture and the built environment: psychiatric spaces in historical context. London. Park, D. C. (1997): Space, place and the asylum. Health and Place. 3, 71-72. Park, D. C. (1995): An imprisoned text: reading the Canadian Mental-Handicap Asylum. Unpublished PhD thesis, York University, Ontario, Department of Geography. Parr, H. (2011): Mental Health and Social Space: Towards Inclusionary Geographies? Somerset. Parr, H. (1991): The impact of mental health care facilities upon two urban residential districts in Nottingham. Unpublished B.A. dissertation, St. David's University College, Lampeter. Parr, H./Philo, C. (1995): Mapping 'mad' identities. In: Pile, S./Thrift, N. J. (Eds. ): Mapping the subject: geographies of cultural transformation. London, 199-225. Philo, C. (2004): A geographical history of institutional provision for the insane from medieval times to the 1860's in England and Wales. Lewiston, N.Y.
Philo, C. (2000): Post-asylum geographies: an introduction. Health and Place. 6, 135-136. Philo, C. (1997): Across the water: Reviewing geographical studies of asylums and other mental health facilities. Health and Place. 3, 73-89. Philo, C. (1995): Journey to asylum: a medical-geographical idea in historical context. Journal of Historical Geography. 21, 148-168. Philo, C. (1987): Fit localities for an asylum: the historical geography of the nineteenth-century “mad-business” in England as viewed through the pages of the Asylum Journal. Journal of Historical Geography. 13, 398-415. Shields, R. (2001): ‘Henri Lefebvre’. In: Elliott, A./Turner, B. S. (Eds. ): Profiles in contemporary social theory. London, 226-37. Smith, C. A./Wright, D./Day, S. (2007): Distancing the mad: Jarvis's Law and the spatial distribution of admissions to the Hamilton Lunatic Asylum in Canada, 1876-1902. Social Science & Medicine. 64, 2362-2377. Soja, E. W. (2011): Postmodern geographies: the reassertion of space in critical social theory. London. Soja, E. W. (1996): Thirdspace: journeys to Los Angeles and other real-and-imagined places. Cambridge. Thrift, N. J. (1996): Spatial formations. London. Tomes, N. (1994): The art of asylum-keeping: Thomas Story Kirkbride and the origins of American psychiatry. Studies in health, illness, and caregiving. Philadelphia. Wang, C./Burris, M. A. (1997): Photovoice: Concept, Methodology, and Use for Participatory Needs Assessment. Health Education & Behavior. 24, 369-387. Wang, C./Burris, M. A. (1994): Empowerment through Photo Novella: Portraits of Participation. Health Education Quarterly. 21, 171-86. Wolch, J./Philo, C. (2000): From distributions of deviance to definitions of difference: past and future mental health geographies. Health and Place. 6, 137-157.